Fairways weave among tall pines, demanding accuracy. Front and back 9 end at parking lot. Restrooms across road from #15. Memorial Parkway (Hwy 231) to Drake Ave., west to 1st St., north to park, course on left. Pretty cool to play the oldest existing course in it's original location (allegedly). Never would have thought I'd find it in AL, my home state. Figured it'd be in Cali, the alleged birthplace of disc golf as we know it. So if you're in the area, you got to play it for that reason alone. 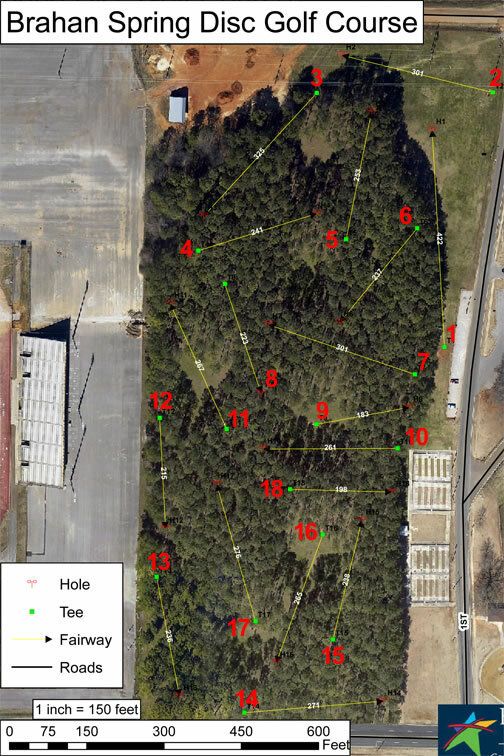 The course itself is decent for a relatively flat, compact course, throwing mostly technical shots through pine trees. It's fun, but if I lived here I'd see myself playing Indian Creek mostly. The oldest existing course still in it's original place! Overall good course. Your traditional wooded course, with a variety of shots.